The USB31000SPTB USB 3.0 to Gigabit Ethernet Adapter lets you add a Gigabit network port to your laptop or Ultrabook™ computer through a USB 3.0 port, and features an integrated USB 3.0 pass-through port that keeps your USB port available for use with other peripherals. 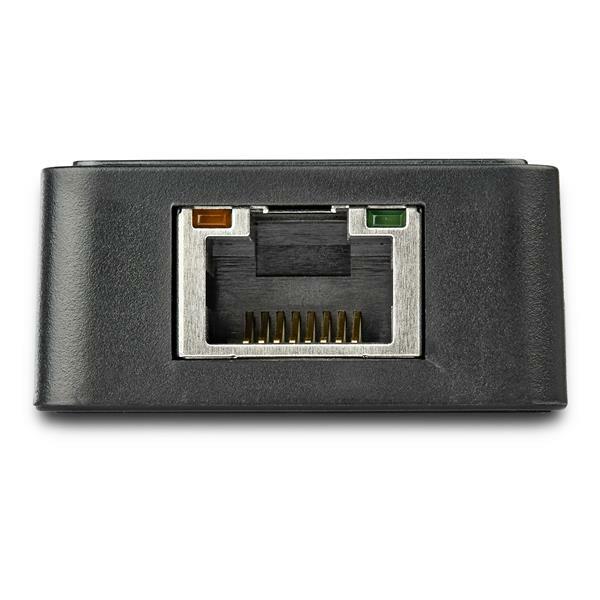 The RJ45 port supports 10/100/1000 Mbps Ethernet and is fully compatible with IEEE 802.3i/u/ab standards. 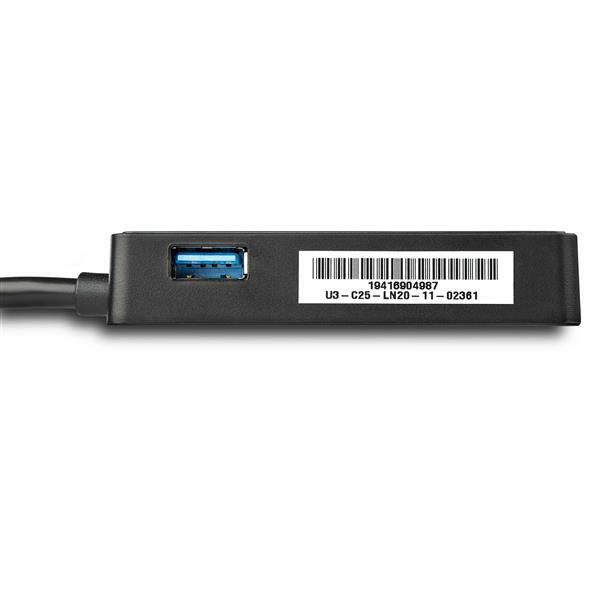 The network adapter is the ideal laptop accessory for your Microsoft Surface™ Pro 4, Surface Pro 3, Surface 3, Surface Pro 2 or Surface Book. 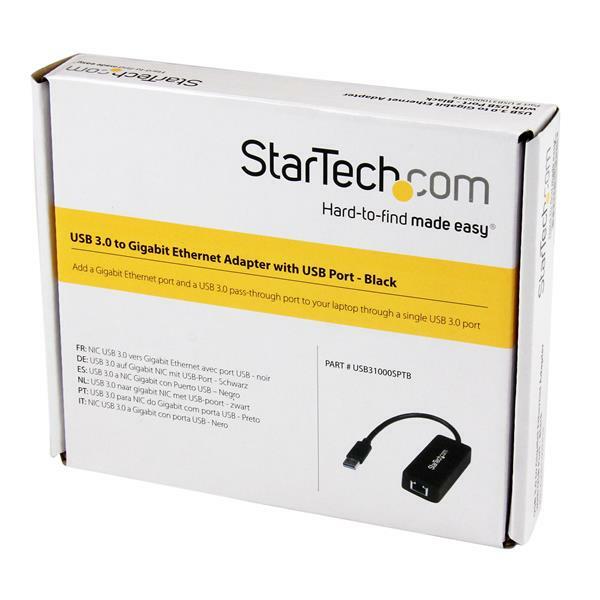 An ideal replacement LAN adapter or laptop accessory, this compact USB 3.0 NIC leverages the 5 Gbps speed of USB 3.0 to provide full gigabit bandwidth and also offers backward compatibility with USB 2.0 systems (speed limited by USB bus). 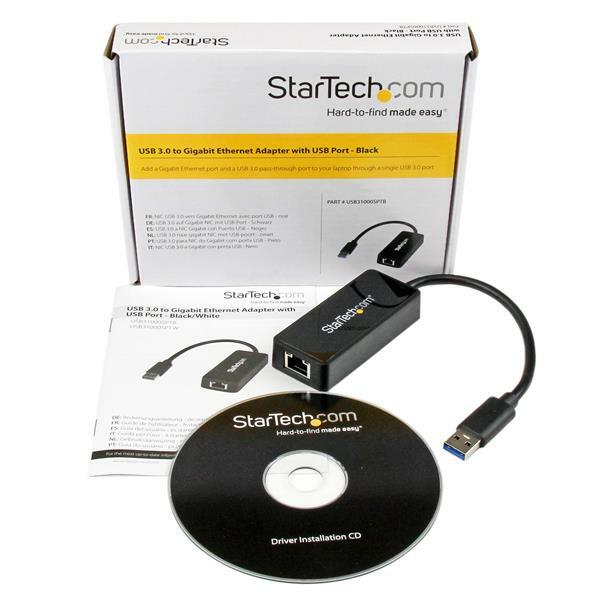 The adapter supports features such as IPv4/IPv6 packet Checksum Offload Engine (COE) and TCP large send offload to reduce the load on your CPU. 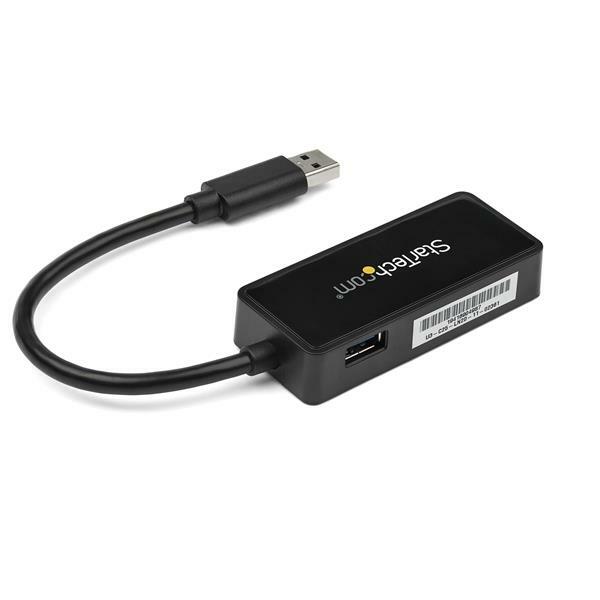 Jumbo Frames, full-duplex operation with 802.3x flow control and VLAN tagging are also supported, making this an efficient and full-featured USB network adapter. How do I install my network card in Mac OSX 10.6.x - 10.9.x? Note: Mac OS X usually saves the files to the Downloads folder that is associated with your user account and is located on the drive where Mac OS X is installed (for example, Macintosh HD\Users\your_name\Downloads). 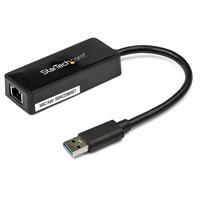 Double-click the [ASIX88179] Mac USB Network Adapter.zip file. Press and hold the Control key and click the dmg file. To mount a drive on the desktop, click Open. Double-click the drive that you just mounted on the desktop. Press and hold the Control key and click the setup file. After your computer restarts, connect the device to your computer.